As the Puli is a natural herder, it is constantly busy and looking for something to do. This consistent curiosity can be satisfied with a walk, job, or a lively play session. 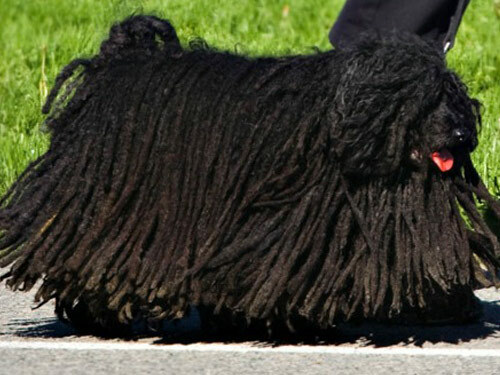 The Puli can survive in the outdoors with temperate to cool climates, but can also find success as an indoor house pet. The extensive coat of the Puli can hold significant debris, but the coat is actually a nonshedding coat. If the coat is to be brushed, it must be done at least every other day. If the coat is to be corded, the cords will need regular attention to separate them since they can contain dirt. To bathe a Puli takes a great amount of time and effort and it can take up to an entire day for the coat to fully dry. The coat can be cut, however the signature appearance of the breed is then lost. The Puli is a breed that is full of life with mounds of energy. It is inquisitive and lively with a strong natural intelligence. Daily exercise is required to satisfy the needs of this busy breed. Although vivacious, it can be tough and stubborn and may come at other dogs with aggression. The Puli is a protector and is very in tune with its surroundings. It does have a tendency to bark regularly. The major health concern for the Puli is known as CHD, or Canine Hip Dysplasia. This is a disease that involves improper growth of the hip and can eventually lead to arthritis. On occasion, PRA, or Progressive Retinal Atrophy is seen in this breed, which can lead to blindness. Deafness is also seen occasionally with the Puli. To maintain good health, the eyes, hips, and hearing should be tested often. A healthy Puli will live for approximately 10 to 15 years on average. During the ninth century, the ancestor of today’s Puli arrived in the central Danube area along with the Magyar tribes from the eastern Urals. The Magyar tribes brought along a range of Sheepdogs and mixed with the Turkish people during their travels. The Puli has a resemblance to the Tibetan Spaniel and some believe that this journey played a role in its origin. Agile for their small stature, these small dogs had the ability to herd sheep and turn a sheep over by leaping onto its back. They were easily recognizable by the shepherd due to their dark coloring among the sheep. The larger varieties were most likely used as guard dogs at night by the Magyar's, while the smaller stature varieties performed the herding duties. The Puli breed was close to extinct in the sixteenth century when European invaders took over Hungary and brought in their people, sheep, and dogs. These foreign dogs were used for breeding with the native Pulik, producing a Pumi and the continued inter breeding of the Puli and Pumi almost caused the loss of the Puli's existence. The Puli was eventually resurrected in the 1900s. The Pulik in Hungary at this time were of a great variety in height. There were large "police" varieties that acted as guard dogs. There were medium "working" class Puli that worked as the herders and have since become the desired size. And there were small "dwarf" sized versions as well. The United States Department of Agriculture took advantage of the natural herding abilities of the Puli in 1935 and imported them into the Country. The effort to improve herding dogs in the United States through this maneuver was slightly stalled by the ongoing war, but the breed did gain AKC recognition in 1936. As many Hungarians began to escape the war and conflict, their dogs came along for the ride and this caused a quick spread of the breed throughout Europe. Today the Puli exists scarcely as a family dog in the home or a show dog, but continues to be a skilled herder.